In the past couple years there has been a wave of producers from the UK fusing the various strains of UK garage they grew up listening to with house and techno. Michael Dodman, better known to us as Huxley, is one such producer. Starting out at the tender age of 16, he started producing under the names Mr. Mushrooms and Dezz Jones with his own take on the UK garage which deeply influenced him at the time. It was mid-2009 that we first heard from him as Huxley, appearing on the Sassanids EP with Ethyl on the Cécille Numbers imprint. The following year he started releasing on his own, his taut, deep house productions pulsing with his earlier influences, adding energy and an urgent dance floor feel to the tracks. He also began to remix other artists, helping to spread his name further afield while he issued new EPs for labels like Tsuba, Loss Audio and Kolour Recordings. Since then Huxley has started his own label, been remixed by luminaries like Aybee, MK and Roman Flügel, and with recent releases for 20:20 Vision and Hypercolour shown that he continues to grow as a producer — his star is still very much on the rise. 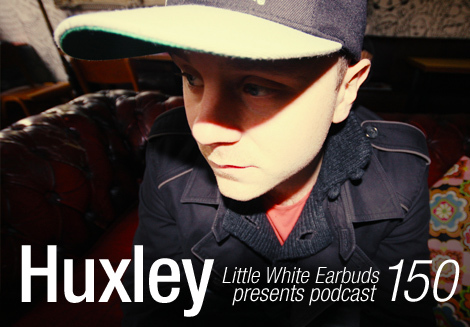 Little White Earbuds got in touch with Huxley to find out a bit more about his Saints & Sonnets label, the pros and cons of tackling a lot of remixes, and what his favorite cheese is. He also put together our 150th exclusive podcast, a sweltering mix of house and techno peppered with some forthcoming gems from the producer himself. First of all, where did you come up with your producer name from? If it is from Aldous Huxley, what is your favorite Huxley book? Michael Dodman: Yeah, it was inspired by Aldous Huxley. I was reading Brave New World at the time when I had to come up with a good alias. I still think that’s one of my favorite books ever. However, I also like his book The Doors of Perception. I haven’t actually read any more to be honest. I definitely should, though. So when you first started out producing you were making UK garage. What were some of the key moments for you in terms of your progression in to getting into house and techno more? Well I started producing garage when I was 16. This is when I was too young to actually go out to hear the music. The thing that started getting me more into house and techno was going out every weekend in London when I got the age of about 17/18. I tried many times to go out before, but because I looked about 12 it never really worked (apart from at drum ‘n’ bass raves for some reason). That was definitely the time that my musical tastes started to change. But I didn’t get the confidence to make house for a few years yet. Tell us a bit about your own label, Saints & Sonnets, with Jimmy Posters. The second and third releases are both by fairly new producers. Is this the remit of the label, to push newer talent or is that coincidence? It’s just worked out that way, I suppose. We have some more established producers lined up, but we definitely like the thought of bringing through new artists. The next one is a girl called Annie Errez, another new artist, but again a great EP, which is also backed up with a cracking Mr. G remix. We’ve got loads lined up for next year, and I can’t wait to unleash some of it! Does Jimmy produce at all or is he more of a behind the decks/scenes kind of guy? He doesn’t really, but I think he’s tinkering about with some stuff and we have been talking about getting in the studio together for a long time; it’s just not happened. He’s got a great ear for A&R, though, and is a pretty great DJ too. It all works pretty well when it comes to us picking the music. We’re normally on the same page, and if we’re not and one is passionate about something we both trust each other that we’re doing the right thing. You’ve been producing and releasing for a little while now. When did you first think that things were getting “big” for you? Probably when things really kicked off for me was “Let It Go” earlier in 2012, but I felt things starting to move and also started to find my own sound around the start of last year when I made “Shower Scene” and a few other bits. I think the remix for Rebirth helped a lot, too. You’ve had some pretty impressive names remixing your tunes, including MK on your latest on Tsuba. Which has been your favorite remix of one of your tracks? You’ve mentioned in other interviews about reaching a point where you’ve become a lot happier with your productions. I assume this has been a result of becoming more confident with your abilities as well as homing in on a personal style. Do you actively undertake production lessons on your own to further your abilities or is it more a matter of just plugging away, delving deeper into your tracks? I’ve never actually had any lessons; I’ve only ever just sat down and taught myself. I’ve picked up a few tricks from some of the people I’ve worked with, but that’s about it. What do you think has been the biggest help for you in getting better at production and what has been the biggest hurdle you’ve had to overcome? Probably not having any lessons. I started when I was 13/14 (starting playing around anyway), but I think teaching yourself takes a lot longer. Also I think that if I started these days it would take a bit less time as the programs back then were a bit less geared towards helping beginners. I think things like Ableton etc have made it a lot easier which I see as a great thing. I just wish they were around when I started! You’ve clocked up an impressive number of remixes over the past few years. Do you find remixing other people’s work gives you a bit of an insight into how other people work and therefore help you too? Not really. I only ever really use one bit of the original anyway. It probably has sub-consciously, but yeah, not really. I’m really bored of remixing at the moment. For a while I loved it, putting a different slant on someone else’s idea, but I think I’ve just done too many for now. I’m really enjoying making originals again, which this year has been very few and far between. Give it a few months though and I’ll probably be aching to do some more remixing. So you’ve been working with Sam Russo of late. How did you guys meet? We met after I released some music and he got in touch to say he liked it and was playing it a bit. He showed me some of the stuff he was working on and I was into it, and he came to my studio and we just worked from there. I think we’ve been working together for about three or four years now. Is the way you guys work together different than how you work with Ethyl? I’ve never really thought about it. It obviously is, but I can’t really put my finger on it. Maybe we’re a bit quicker finishing stuff than me and Tim have ever been? Do you have any personal goals within what you’re doing in music, things you’re working towards or want to be able to tick off? My new goal is my album. Although I think that’s more a natural step than a goal. In terms of other goals, maybe just being able to carry on doing this for the rest of my life. Apart from that, there’s nothing really to mention. This is definitely the deeper side to what I can play. It’s a lot more house and techno than a few of my sets lately really, but this is the stuff I really love and can’t always fit in. It’s also been a great chance to play a lot of the vinyl I’ve bought over the last year, mixed with a few new and exclusive bits too! And what can we expect from Huxley and from Saint & Sonnets over the next year? Hopefully more of the same. But, definitely an album and some more singles. Carry on touring. Got some great dates for next year already. And as for S&S, it’s set to become a lot more prolific in terms of the amount of releases. We’ve not dropped the quality though. I know interviews can get a bit tedious, so if there’s anything you wish that you’d get asked, then ask yourself now and answer the question too. What’s your favourite kind of cheese? Answer: white stilton and cranberries. Absolute muck!!! If only for the last track maybe. This is quality, can’t wait for BellyWedge to be released!! !